Kylie Jenner's Lip Kit Factory Says Sweatshop Accusations Are "Completely False"
"These allegations are completely false and fabricated," the company's chief executive said. The chief executive of the company that makes Kylie Jenner's popular line of lipsticks and lip glosses is firing back against accusations of "sweat shop"-type working conditions. Radar pulled the online reviews of Spatz Laboratories from Indeed.com, where people claiming to be former employees complained of poor working conditions. One review, titled "Sweat Shop," claimed pay is "very minimal for the amount of work that is requested with no benefits." The Radar report also included three FDA citations against Spatz Laboratories in 2006. "The batch production and control records do not include a statement of the actual yield and percentage of theoretical yield at appropriate stages of processing for each batch of drug product produced." "Batch production and control records do not include complete labeling control records, including specimens or copies of all labeling used for each batch of drug product produced." "Equipment used in the manufacture, processing, packing or holding of drug products is not of appropriate design, of adequate size, and suitably located to facilitate operations for its intended use and cleaning and maintenance." However, Spatz Laboratories CEO Mary Beth Siddons told BuzzFeed that the allegations "are completely false and fabricated." "Spatz Laboratories proactively works to provide a healthy and safe working environment for our employees," she said. "We have implemented a number of initiatives to insure compliance to not only the law, but the standards set forth by cosmetic good manufacturing guidelines. "These types of initiatives include but are not limited to safety committees and regularly conducted third party audits. As the business grows we make the proper improvements to support that growth because the health and wellness of our employees is a main priority." The company also released an official statement saying, "Spatz Laboratories is not regulated by the FDA and has not been inspected since 2006, at which time we were presented with an immediately implemented suggested corrective action." Spatz Laboratories has over 60 years of experience in manufacturing and has always maintained the highest level of standards according to United States labor laws. We are an American company operating by American standards and in accordance with (cosmetic Good Manufacturing Processes). Spatz has no previous record of any issues with government compliance or the Department of Labor. 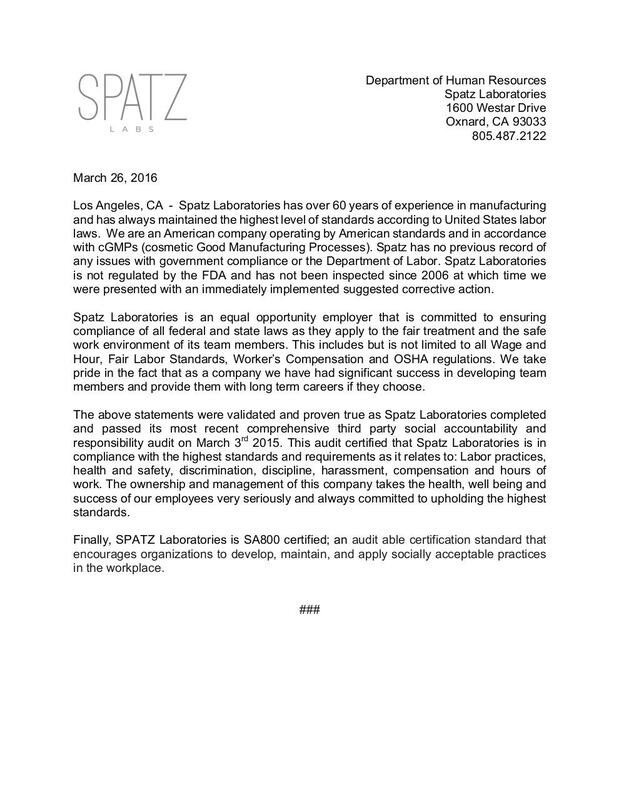 Spatz Laboratories added that it is "committed to ensuring compliance of all federal and state laws as they apply to the fair treatment and the safe work environment of its team members." "We take pride in the fact that as a company we have had significant success in developing team members and provide them with long term careers if they choose," the company added. To read the full statement, go here.